Qualifying households will get an ongoing 5% discount! In celebration of CCI Wireless becoming a 4-H Alberta Bronze Clover Official Sponsor, we are proud to offer free installs and an ongoing discount to 4-H Alberta families! CCI Wireless is a proud 4-H Alberta Supporter. This program invests in our youth, inspiring them to grow our province and its industries forward through passion, innovation, entrepreneurship and community. CCI is proud to provide two new $1500 scholarship opportunities for 4-H members to support their post-secondary education. Living on the farm shouldn’t disadvantage Albertans, especially youth. CCI is dedicated to providing inner-city quality connection, even in the outer limits. By putting community and customers first, CCI connects rural Albertans to the world via the internet to enable the long-term sustainability of rural life. Our commitment to learning to do by doing allows CCI to constantly innovate and deliver the best technology possible to our customers, making the business and social case for providing quality internet to rural Alberta, where others cannot. New CCI customers will get a free install and an ongoing 5% discount on any two-year contract! Current customers will get an ongoing 5% discount added to any existing plan! To celebrate CCI’s sponsorship of 4-H Alberta, we have special offers available to new and existing customers! With proof that the household is a current 4-H Alberta family with a valid membership card* (as of January 1, 2019), a free install and ongoing 5% discount on any plan with a two-year contract will be applied! Offer does not expire. 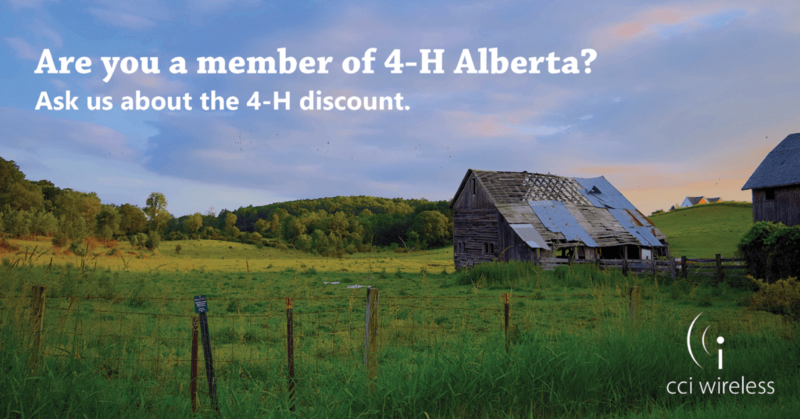 Any current CCI customers who can provide proof that their household is a current 4-H Alberta family with a valid membership card* (as of January 1, 2019) will receive an ongoing 5% discount on any existing plan! Offer does not expire. *NOTE: Other proof of current involvement with 4-H Alberta can be approved on a case-by-case basis to take advantage this offer. Email alternative proof to a current 4-H Alberta membership to customercare@cciwireless.ca using a variety of file formats: .jpeg, .png, and PDF. We’ll get back to you within a day. Pictures of proof taken with your smartphone or a digital scans are acceptable.